gUniversity of California Los Angeles Stroke Center (D.S.L. ), Los Angeles, California. BACKGROUND AND PURPOSE: Uncertainty persists regarding the safety and efficacy of endovascular therapy of M2 occlusions following IV tPA. We reviewed the impact of revascularization on clinical outcomes in 83 patients with M2 occlusions in the Interventional Management of Stroke III trial according to specific M1-M2 segment anatomic features. MATERIALS AND METHODS: Perfusion of any M2 branch distinguished M2-versus-M1 occlusion. Prespecified modified TICI and arterial occlusive lesion revascularization and clinical mRS 0–2 end points at 90 days for endovascular therapy–treated M2 occlusions were analyzed. Post hoc analyses of the relationship of outcomes to multiple baseline angiographic M2 and M1 subgroup characteristics were performed. RESULTS: Of 83 participants with M2 occlusion who underwent endovascular therapy, 41.0% achieved mRS 0–2 at 90 days, including 46.6% with modified TICI 2–3 reperfusion compared with 26.1% with modified TICI 0–1 reperfusion (risk difference, 20.6%; 95% CI, −1.4%–42.5%). mRS 0–2 outcome was associated with reperfusion for M2 trunk (n = 9) or M2 division (n = 42) occlusions, but not for M2 branch occlusions (n = 28). Of participants with trunk and division occlusions, 63.2% with modified TICI 2a and 42.9% with modified TICI 2b reperfusion achieved mRS 0–2 outcomes; mRS 0–2 outcomes for M2 trunk occlusions (33%) did not differ from distal (38.2%) and proximal (26.9%) M1 occlusions. CONCLUSIONS: mRS 0–2 at 90 days was dependent on reperfusion for M2 trunk but not for M2 branch occlusions. For M2 division occlusions, good outcome with modified TICI 2b reperfusion did not differ from that in modified TICI 2a. M2 segment definition and occlusion location may contribute to differences in revascularization and good outcome between Interventional Management of Stroke III and other endovascular therapy studies. We herein summarize the efficacy and safety outcomes of combined IV-EVT in DSA-M2 occlusions in the Interventional Management of Stroke III trial as originally reported,13 and we also report post hoc subgroup analyses that explored the hypothesis that anatomic heterogeneity, operational definitions, and the affected M2 segment location have an effect on outcome in the reperfusion of M2 occlusion. IMS III eligibility and exclusion criteria, randomization and statistical methods, and results have been previously reported.13⇓–15 CT angiography, CT perfusion, and MR angiography and/or perfusion were allowed in centers where they were established as a local standard of evaluation and care. DSA was reviewed by the angiographic core lab (T.A.T., D.S.L. ), and M2 segment and revascularization scores were determined by consensus. mRS 0–2 outcomes were analyzed according to mTICI reperfusion results. The relationship of reperfusion to mRS 0–2 and 0–1 outcomes was determined. As in the Emergency Management of Stroke and IMS I and II trials, the operational definition of M1 occlusion was that 100% of the MCA cortical distribution was at risk, less anterior temporal artery (ATA) supply, with no antegrade M2 branch filling.20⇓–22 The corollary of this physiologic definition of M1 occlusion is that filling of ≥1 classic M2 branch then represents M2 occlusion. Baseline clinical characteristics of 83 evaluable M2 and 135 M1 occlusions proximal (M1P) or distal (M1D) to the lenticulostriate origins were excerpted from case report forms and compared for differences. Multiple secondary observations of M1 and M2 anatomic features were derived post hoc from baseline and/or posttreatment DSA and recorded, to identify similarities or differences that might discriminate revascularization and clinical outcome. An isolated branch arising from M1, adjacent to and with a similar course to the ATA but larger and distributing to the mid- and posterior temporal lobe supply, was termed a “posterior temporal M2 branch” (Fig 1). An isolated branch arising from M1 simulating the ATA but giving origin to the ATA and the mid- and posterior temporal lobes was termed a “holotemporal” M2 branch (Fig 2). The isolated holotemporal or posterior temporal branch might also variously supply portions of the inferior parietal lobe or temporo-occipital region via distal M3 and M4 cortical arteries. The single vessel continuation of M1 beyond the isolated patent posterior temporal or holotemporal branches is termed the “M2 trunk,” which simulates the distal M1 trunk (Fig 3). A, Right M1 trunk gives rise to the ATA with the posterior temporal branch filling on microcatheter injection. B, Lateral view baseline common carotid arteriogram confirms mid- and posterior temporal lobe cortical supply from the patent posterior temporal artery. A, Anteroposterior: short M1 trunk with no ATA arising is shown. An isolated M2 holotemporal branch originates, simulating and giving origin to the ATA. It then exits the insular cistern, with multiple middle and posterior temporal arteries draping over and supplying the remainder of the temporal lobe (B). B, Lateral view common carotid arteriogram confirms filling of the holotemporal branch, with no other MCA branches filling. Composite diagram of M1-M2 trunk anatomy based on IMS III post hoc analysis. 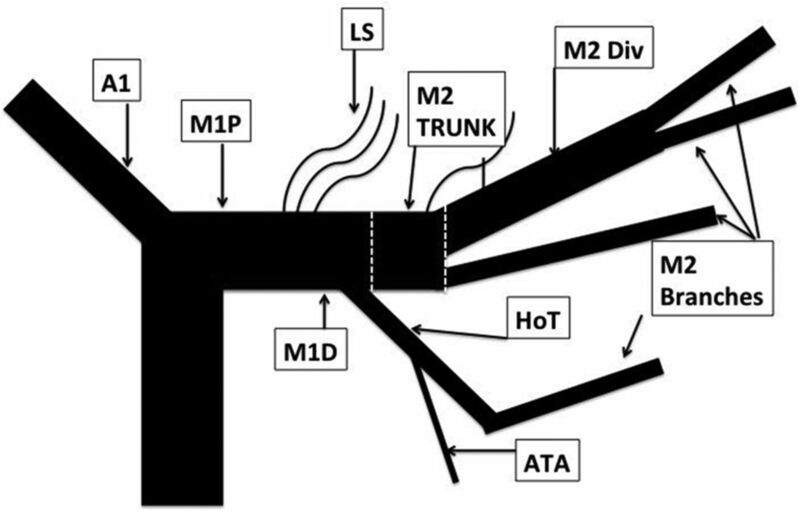 The M1 trunk proximal to the lenticulostriate arteries (LS) is termed “M1P.” The anterior temporal artery arises from the holotemporal M2 branch (HoT). The M2 trunk is a continuation of the distal M1 trunk, beyond a holotemporal (HoT) or posterior temporal M2 branch. The M2 trunk divides into M2 divisions (M2 Div) or branches. M2 divisions divide further into M2 branches. Post hoc secondary subgroup analyses in 79 evaluable cases, including review of revascularization and clinical outcome, were also performed, including analysis of the following: 1) occluded segment description (trunk, division, division-branch, branch); 2) estimated percentage MCA distribution of the region at risk according to the occluded segment anatomy; 3) M2 occlusion location (proximal, mid, or distal) and number (single or multiple) on revascularization and outcome; and 4) the presence of isolated holotemporal and posterior temporal lobe branch supply and M2 trunk occlusion on day-2 CTP core infarct and penumbra volumes. Primary safety end points recorded were mortality and symptomatic intracranial hemorrhage, defined as any intracranial hemorrhage associated with neurologic deterioration within the first 30 hours of IV tPA initiation. Secondary end points included parenchymal hematoma types 1 and 2; asymptomatic intracranial hemorrhage; subarachnoid hemorrhage or intraventricular hemorrhage; angiographically identified vessel dissection or perforation; and DSA-identified emboli into a new (previously unoccluded) arterial territory. Twenty-six M2 and 45 M1 occlusions from IMS I and II were reviewed post hoc for confirmation of reporting reproducibility and the effect of anatomic characteristics on outcome compared with IMS III. Differences in reperfusion and mRS 0–2 outcomes between M2 occlusion subgroups were analyzed with the χ2 test, and differences in percentage MCA distribution at risk between subgroups, via the t test. Complete patient accountability, clinical, revascularization, and safety results have been previously reported for the entire EVT and IV rtPA groups.13,20 No differences in baseline clinical characteristics of 83 subjects with M2 occlusion and 135 previously reported M1 occlusions treated with EVT were identified (On-line Table 2). ASPECTS of 8–10 was significantly lower with M1 occlusion proximal to the striate arteries (P = .02). The proportion of subjects with a baseline NIHSS score of ≥ 20 was not. Overall, 34/83 (41%) mRS 0–2 outcomes occurred with M2 EVT. Reperfusion trended (P = .09) toward an association with good outcome (46.7% mRS 0–2 for mTICI 2–3 compared with 26.1% for mTICI 0–1; risk difference, 20.6%; 95% CI −1.4%–42.5%). M2 occlusions were treated predominantly by standard microcatheter thrombolysis (n = 54, 65.1%), with 5 sonography-assisted thrombolysis, 13 Merci retriever (Concentric Medical, Mountain View, California), 10 Penumbra System (Penumbra, Alameda, California), and 1 Solitaire Stent (Covidien, Irvine, California) thrombectomy procedures. mTICI 2–3 reperfusion was achieved in 66% (39/59) of thrombolysis-only treatments and in 88% (21/24) of thrombectomy-device procedures (P = .048). The Table summarizes M2-segment-occlusion mRS 0–2 outcomes according to mTICI reperfusion results for not only each mTICI grade but also grouped as mTICI 0–1 versus 2–3 and as 0–2a versus 2b–3. Good outcome for trunk occlusion required mTICI 2b–3 reperfusion. No mRS 0–2 outcome differences were identified for mTCI 2a-versus-2b reperfusion for division occlusion. M2 branch occlusions achieved numerically poorer mTICI 2b–3 reperfusion (28.6%) and mRS 0–2 outcomes overall (32.1%) compared with trunk and division occlusions. On post hoc review of M2 occlusions, ATAs were identified arising from 42 (53.2%) M1 and 34 (43.0%) M2 vessels in 79 evaluable subjects, either before or after revascularization. Eighteen (22.8%) holotemporal (n = 10) and posterior temporal (n = 8) branches arising from M1 and simulating the ATA were identified on baseline DSA, half with other patent M2 segments. Seven holotemporal and 2 posterior temporal branches were the only M2 branches patent, defining M2 trunk occlusion and closely simulating M1 trunk occlusion in appearance. Lenticulostriate arteries arose from 16 (20.3%) M2 segments overall, but in association with 5 (50%) patent holotemporal arteries and 3 (33.3%) M2 trunk occlusions. On the basis of these anatomic features and the IMS III definitions, the core lab estimated that 30.4% of M2 occlusions could have been termed M1 occlusion, predominantly where posterior temporal or holotemporal branches simulated the ATA (10/18 versus 14/61, P = .008). One instance of patency of an orbito-operculofrontal division as the only patent segment, without ATA, was classified as an M2 division occlusion, with no ATA or other M2 segments filling from a large trunklike segment. Post hoc analysis of revascularization and clinical outcomes for trunk, division, division-branch, and branch occlusions and for proximal and distal M1 occlusion is detailed in On-line Table 3. mRS outcome 0–2 for M2 occlusion was similar to that for M1D, despite numerically lower mTICI 2–3 and 2b–3 reperfusion. M2-plus-M1D occlusions combined had a higher proportion of mRS 0–1 and 0–2 outcomes compared with proximal M1 occlusion (P = .06 and 0.07, respectively). Good outcome for M2 trunk occlusion (33.3%) was numerically greater than for M1P occlusion (26.9%, P > .05), but not for M1D (38.2%, P > .05). M2 trunk occlusions were associated with a greater percentage area distribution at risk for infarction compared with division and branch occlusions combined (P = .0012), as were division occlusions compared with branch occlusions (P < .0001). No difference in MCA distribution at risk was estimated between 16 division-branch and 12 branch occlusions, but excellent and good outcomes were numerically fewer for division-branch occlusions. Fifty-four of 79 (69.1%) DSA-M2 occlusions were proximal, with greater estimated percentage MCA distribution at risk compared with mid- or distal occlusions (P = .0001). Ten (12.7%) multiple M2 occlusions included 6 divisions with additional branch occlusions and 4 multiple branch occlusions. The estimated percentage MCA at risk was greater for multiple M2 occlusions than for single ones (P = .05). Post hoc review of anatomic features of 27 M2 and 45 M1 previously treated IMS I and II occlusions confirmed classification consistency with IMS III, including patent holotemporal branches in 3 M2 trunk occlusions (11.1%). Fifty percent of division-branch or branch occlusions were confirmed in IMS I and II, compared with 37.1%, in IMS III. In the 3 IMS studies, 5/12 (41.6%) M2 trunk occlusions achieved mRS 0–2 outcomes. Symptomatic intracranial hemorrhage occurred in 7.2% (6/83) of subjects with IMS III M2 occlusions. One (1.2%) arterial perforation and 3 (3.6%) emboli into a new (previously unoccluded) arterial territory were identified by the core lab. Ten deaths (12.0%) occurred. In IMS III, as in IMS I and II, among DSA-defined M2 occlusions, independent functional outcome (mRS 0–2) was not associated with mTICI 2b–3 reperfusion compared with EVT of the more proximal intracranial ICA or M1 occlusions.20 No good outcomes for trunk occlusion occurred in the absence of mTICI 2b–3 reperfusion. No differences in good outcome were identified for mTICI 2a-versus-2b reperfusion for division occlusion. Good outcome was not associated with reperfusion in branch occlusions; this finding may be due to the small sample size (n = 29), limited amount of at-risk tissue, or recanalization spontaneously or by IV rtPA alone after completion of EVT. While IMS III M2 mTICI 2–3 reperfusion was better than that in IMS I and II (72.3% versus 60.9%), mRS 0–2 outcomes were poorer (40.9% versus 69.6%).1,4,9 Good outcomes for M2 occlusion with mTICI 0–1 reperfusion were more frequent in IMS I and II (26.1% versus 77.7%), all occurring with branch occlusions. In addition to differences in M2 segment occlusion types treated, differences in the definition of M1 and M2 occlusion may contribute to reported outcome differences.23,24 A similar ratio of M2-to-M1 occlusion in IMS I and II (64.4%) and IMS III (60.7%) suggests comparable general definition application. Whereas PROACT II had a similar percentage ratio (62.2%), the ratio was lower (40.7%) in the Middle Cerebral Artery Embolism Local Fibrinolytic Intervention Trial (MELT).25 The definition of M1 versus M2 has historically been based on anatomic criteria, with the horizontal sphenoidal MCA segment in the stem of the Sylvian fissure, proximal to the insula, termed M1, irrespective of the at-risk proportion of the brain supplied by the occluded segment.26 The IMS operational functional definition of M1 occlusion places virtually its entire cortical distribution at risk and allows confident comparability of baseline occlusion and outcome data among the IMS studies. The classic clinicoanatomic model of 2 M2 divisions (superior/anterior or inferior/posterior) occurs in approximately 50% of instances of M1 trunk branching, pseudo-bifurcations, and -trifurcations, each in approximately 25% of patients.27,28 The description of postdivision branching has not been uniform historically. Where M2 “division” occlusion therapy in PROACT II included treatment of not only divisions that will branch but also branches from divisions and individual branches, potential confusion in terminology exists. Standard arteriographic references avoid “division” entirely, refer to groups or complexes, mix “branch” and “artery” somewhat interchangeably, and have used the term “trunk” to vaguely describe a large Sylvian segment beyond an operculofrontal branch terminating in parietal and angular branches.29 Muddled terminology risks including, lumping, equating, and then comparing occluded classic M2 division occlusions (53.1%) with smaller, single, even distal M2 division-branch (19.8%) or branch occlusions (16.0%) or major trunks beyond a single patent, classic M2 branch (11.1%) in stroke-treatment studies. Two nomenclature adaptions are used here for post hoc description and analysis of observations initially made on primary core lab reporting. The holotemporal branch supplying the entire temporal lobe was linked to M2 “trunk” occlusion when no other M2 branches were filling, simulating M1 occlusion. Designation of any M2 branch patency determining the occluded segment is also termed “M2” as either trunk, single or multiple divisions, division-branches, or branches. The percentage MCA at risk was greater with M2 trunk occlusion than in its absence, as was division occlusion with division-branch and branch occlusion. However, the percentage MCA at risk, mTICI 2–3, and mRS 0–1 and 0–2 were lower with branch than division trunk occlusion. This contradiction requires further analysis of baseline CT and CTA imaging findings to determine whether more proximal occlusions may have already futilely recanalized, leaving only residual branch occlusion before DSA. Reperfusion results were preliminarily reported here variously as mTICI 2–3 and/or 2b–3 to allow comparison with IMS I and II results of failed reperfusion versus outcome. Neither interobserver agreement in distinguishing 2a versus 2b reperfusion nor mTICI 2b–3 reperfusion as a predictor of good outcome for M2 occlusion had yet been shown. The latter is not confirmed here for division or branch occlusion, and no difference in mRS 0–2 outcome between mTICI 2a versus 2b for division occlusion was identified with reperfusion methods used (Table). The major limitation of the data and explorative analysis presented here may be perceived in its derivation within the futile IMS IV-EVT treatment paradigm and the treatment methods used. Although thrombectomy devices may be more effective than thrombolysis alone across the M2 group, larger studies with newer devices are indicated for M2 occlusion. Emphasizing terms such as “M2 trunk” and “holotemporal artery” would be irrelevant had not retrospective analyses demonstrated that the unique anatomic features might confer potential relevant differences in brain at risk and/or outcome. Comparisons of small subgroup numbers here, such as the M2 trunk group, are subject to error. Uncommon occlusions beyond the patency of other single segments (such as orbitofrontal or operculofrontal branches) may also be classified as trunk occlusions in the future. However, the operational IMS occlusion model, excluding M1 occlusion if any M2 branch is filling, reduces the subjectivity of vessel orientation/course, eliminates dilemmas in identifying and classifying major branch points, and becomes one approach to assuring uniformity in outcome analysis for not only M1 occlusion primarily but also M2 segment occlusion secondarily. In IMS III, revascularization rates were higher but mRS 0–2 outcomes were lower for combined IV rtPA–EVT for M2 occlusion than those measured in IMS I and II. mRS 0–2 outcomes differed according to the involved segment, dependent on mTICI 2b reperfusion for trunk occlusion, with no difference between mTICI 2a and 2b reperfusion for division occlusion. mRS 0–2 outcome was not dependent on reperfusion for M2 branch occlusion. Differences in good outcome between the M2 trunk in IMS I, II, and III (41.6%) versus M1 occlusion (32.6%) suggest that failing to distinguish between them could influence reported outcome differences in EVT studies. M2 trunk occlusion, simulating M1 trunk occlusion, is proposed as an M2 occlusion subgroup for closer analysis in EVT studies. Disclosures: Thomas A. Tomsick—RELATED: Grant: National Institutes of Health*; Support for Travel to Meetings for the Study or Other Purposes: IMS III; UNRELATED: Expert Testimony: medicolegal consulations (no travel). Janice Carrozzella—RELATED: Grant: National Institutes of Health–National Institute of Neurological Disorders and Stroke, Comments: IMS III trial*; Support for Travel to Meetings for the Study or Other Purposes: IMS III; UNRELATED: Employment: Department of Radiology, University of Cincinnati. Lydia Foster—RELATED: Grant: National Institute of Neurological Disorders and Stroke. * Michael D. Hill—RELATED: Grant: National Institute of Neurological Disorders and Stroke grant for the IMS III trial*; UNRELATED: Consultancy: for Merck for an advisory panel for clinical trials; Grants/Grants Pending: Medtronic, Bayer Canada, Boehringer Ingelheim, Comments: grants for clinical trials*; Payment for Lectures including Service on Speakers Bureaus: Boehringer Ingelheim, Bayer Canada, Bristol-Myers Squibb-Pfizer, Comments: honoraria for Continuing Medical Education lectures; Patents (Planned, Pending, or Issued): patent for stroke imaging, Comments: patent pending; Stock/Stock Options: Calgary Scientific Inc, Comments: stock ownership in imaging software company. Mayank Goyal—RELATED: Grant: Medtronic, Comments: part funding for the ESCAPE trial, funding for HERMES collaboration*; Consulting Fee or Honorarium: Medtronic, Stryker, MicroVention, Comments: education and advice related to acute stroke treatment and products; UNRELATED: Patents (Planned, Pending, or Issued): GE Healthcare, Comments: licensing agreement for Systems of Stroke Diagnosis. R. von Kummer—RELATED: Support for Travel to Meetings for the Study or Other Purposes: National Institutes of Health; UNRELATED: Consultancy: Lundbeck A/S, Covidien, Synarc Inc, BrainsGate, Boehringer Ingelheim, Comments: Steering Committee for Desmoteplase in Acute Ischemic Stroke 3/4, Data and Safety Monitoring Board for SWIFT PRIME, Adjudication Committee for Desmoteplase in Acute Ischemic Stroke 3/4, Data and Safety Monitoring Board for IMPact, Data and Safety Monitoring Board for ReSPECT ESUS. Andrew M. Demchuk—RELATED: Grant: National Institutes of Health–National Institute of Neurological Disorders and Stroke, Comments: The IMS III trial was funded by National Institutes of Health–National Institute of Neurological Disorders and Stroke. The CT imaging core lab was supported by funds from the National Institutes of Health–National Institute of Neurological Disorders and Stroke*; UNRELATED: Payment for Lectures including Service on Speakers Bureaus: Medtronic, Comments: honoraria for Continuing Medical Education events. Pooja Khatri—RELATED: Grant: National Institutes of Health–National Institute of Neurological Disorders and Stroke U01 for IMS III*; UNRELATED: Consultancy: Grand Rounds Experts, Comments: On-line clinical consultation; Expert Testimony: medicolegal consultations; Royalties: UpToDate, Comments: On-line publication; Other: Genentech, Penumbra, and Biogen, Comments: Genentech pays my salary for my effort as Lead Principal Investigator of the PRISMS trial. Penumbra has paid my salary for my effort as the Lead Neurology Principal Investigator of the THERAPY trial. Biogen has paid my institution and now pays me for effort as a Data and Safety Monitoring Board member. * Yuko Palesch—RELATED: Grant: National Institutes of Health–National Institute of Neurological Disorders and Stroke, Comments: U01 grant support for IMS III*; UNRELATED: Travel/Accommodations/Meeting Expenses Unrelated to Activities Listed: 13th International Symposium on Thrombolysis Thrombectomy and Acute Stroke Therapy, Comments: travel/accommodation expenses to be a speaker; Other: BrainsGate, Comments: statistical member of the Data and Safety Monitoring Board for their clinical trials. Joseph P. Broderick—RELATED: Support for Travel to Meetings for the Study or Other Purposes: Boehringer Ingelheim*; Fees for Participation in Review Activities such as Data Monitoring Boards, Statistical Analysis, Endpoint Committees, and the Like: IMS III; Other: Genentech, study medication; EKOS, Concentric Inc, and Cordis Neurovascular supplied study catheters in early phase of the IMS III trial; UNRELATED: Other: Genentech, financial support paid to the department for role on Steering Committee for PRISMS Trial. Sharon D. Yeatts—RELATED: Grant: National Institute of Neurological Disorders and Stroke, Comments: IMS III*; UNRELATED: Consultancy: Genentech, Comments: I received consultant fees for my role on the PRISMS Trial Steering Committee. David S. Liebeskind—UNRELATED: Consultancy: Stryker, Medtronic, Comments: imaging core lab. *Money paid to the institution. The work was supported by grants from the National Institutes of Health and the National Institute of Neurological Disorders and Stroke (UC U01NS052220, MUSC Uo1NS054630 and U01NS077304) and by Genentech, EKOS, Concentric Medical, Cordis Neurovascular, and Boehringer Ingelheim. Accepted after revision August 1, 2016.